If you’ve ever found yourself wishing you could write more, you’re not alone! I haven’t met a single writer – and I’ve met thousands – who hasn’t talked about feelings of resistance when it comes to writing, and the way these feelings can play havoc with their routine. Where you CAN stand out, is by refusing to accept this wish to be able to write more as a fantasy. Take steps to make it come true! ‘How to develop a consistent writing routine’, ranks high on the list of desirables among the writers I work with. It’s an area I feel passionate about. I’ve found that being able to trust that I can write when I want gives me the necessary courage to achieve my writing dreams. It’s such a privilege to help others do the same. I want you to understand that developing a consistent writing practice is not about pushing back harder than the resistance and those uncomfortable feelings. This rough approach will only increase stress levels in the body. We’re certainly not going to be in the right state of mind to compose a poem when our ‘Fight or Flight’ mechanisms have been activated! My approach is about teaching writers how to realign, so that the creative urge within them is the one leading them to the page. We’ve all felt it – that lovely moment where the words flow. We watch the page filling and there is a sense of effortlessness, of rightness. We are doing exactly what we are meant to do. Could you ever imagine not wanting to write when you feel this way? Exactly! How are you describing your writing? If we talk in these ways, how are we going to bring about an inspiring state of mind that will tempt us to write more? When we redirect our attention to the FACTS rather than the STORY, then we have a chance of slipping out of the narratives of failure and frustration – which always have the same ending – into a more versatile appraisal. The brain loves this! It now has a chance to conjure up a new ending. How long do you usually write for? And what do you use to write – laptop, notebook etc.? What’s your ratio between writing and editing in any one session? How much time do you leave between coming up with an idea and writing it down? the relief of simple analysis! By journaling on these questions, you will shift out of the reactionary place of – my writing practice is so unreliable, into a state of simple analysis. Here, we have the potential for relief! Suddenly, you realise they’re on the slowest setting! You’re no longer a victim to the rain and the way it’s ‘making you feel’. You can now make a decision based on the FACTS and not the STORY: Hmmm, what happens if I just speed them up a little? The next step – and I’m talking baby steps! Now, you take all those questions from before and you answer them in terms of how you want them to be. How often do you want to write? How long do you want to write for? What time of day do you want to write? Where do you want to be when you are writing? What are you going to write with? What will your ratio between writing and editing be in any one session? How much time will you leave between coming up with an idea and writing it down? How do you want to feel when you are writing? This last one is essential! Are we going to turn up regularly for an ‘appointment’ if we know it’s going to be a miserable experience? At this stage, this is all we do. The mistake is that we try to do too much too soon when developing a consistent writing practice. We act, often, from a place of shock. We then churn out three thousand words over a weekend and wake up on Monday feeling empty and exhausted – too exhausted to continue. That’s when the drought starts again. Here, we play out a cycle of binge-writing and self-flagellation. By journalling on the questions, you’re going to trigger your mind into a far more productive way of thinking about your writing. You’re going to start focusing on the windscreen wipers and what you need from them, rather than sitting in dismay about the weather. You’ll start dreaming about how you want to feel when you’re writing. If these ideas and practices resonate with you, then I’m delighted. My approach towards helping people achieve their writing dreams is holistic. I’m running a lovely webinar on ‘Developing your Identity as a Writer’, which will introduce you to more practices that will help you reach the level of creative consistency you desire. Our identity – the way we see ourselves – is vital in order stay on track and take the necessary steps to fulfill our potential. If the way we see ourselves doesn’t match our potential, if you’re telling yourself that you’re not really a writer, and yet writing plays a key role in achieving your dreams, you will experience procrastination. Need help to build a writing routine? Book a free Discovery call with me today and develop habits that will enable you to write more. My work is aimed at guiding writers to a place where they can write, no matter what, coming to the page with an acceptance of who they are and how they want to truly express themselves. 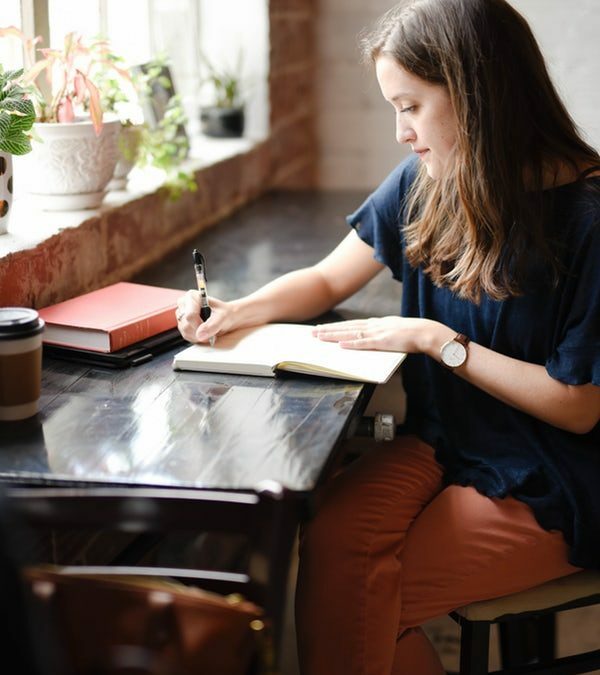 My One to One Coaching, Group Program and Self Study Package are all aimed at enabling writers to write in the way they have always wanted, overcoming doubt, procrastination and fear, to be the writer they truly deserve. Follow me on YouTube for weekly videos of my #writenomatterwhat campaign where I take a typewriter to a new location every week, write for ten minutes on a one-word prompt before reading to camera. This is the year to be the writer that you aspire to be and write, no matter what!